The acronym SDK stands for Software Development Kit. An SDK is a downloadable software package that includes the tools needed to build on a platform. Typically an SDK will include an API or library files (predefined pieces of code to help perform programming tasks), development tools and utilities (for example, an Integrated Development Environment), and other supplementary tools (for tasks such as debugging, building, running and testing the application). Mobile SDKs used for collecting feedback in native mobile apps offer several different advantages in terms of implementation and usage. SDKs allow you to quickly get things up and running. 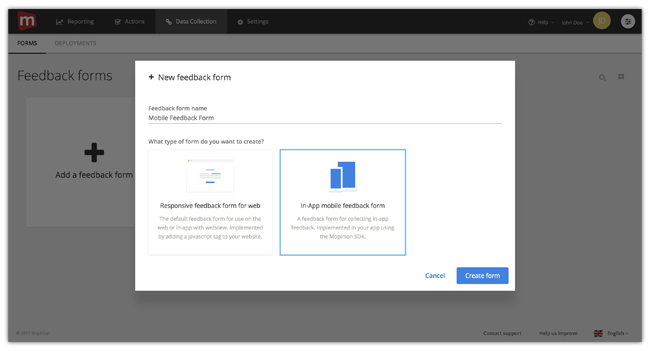 It is easy to integrate new features to your app (such as collecting feedback). A lot of things like authentication, posting feedback to your feedback supplier and validation of input fields are already taken care of. Frees up time for your developers to focus on other matters. As previously mentioned, there is much less legwork necessary when using an SDK so your team can focus more on the feedback rather than the set up. 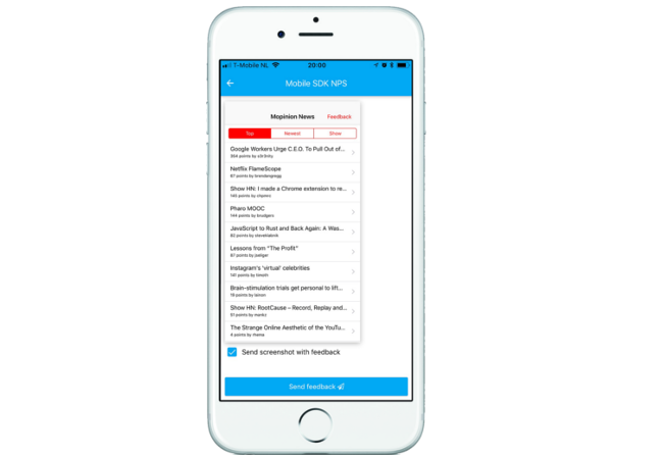 Easily make changes to the feedback form without releasing a new version of the mobile app. What this means is that you can add / change questions or designs from your feedback tool, rather than having to program it into the app. In tune with the needs of these digital roles, the Mopinion SDK is unique in that it includes many important functionalities that other existing SDKs lack. For example, other SDKs tend to fall short in terms of their use of well-known customer experience KPIs (such as NPS, CES, Csat, star ratings), dynamic and easy-to-edit feedback forms, triggering options and in-app notifications based on events (certain user behaviour). These are all coveted tools of the modern marketer looking to improve their native mobile apps based on the voice of the customer. 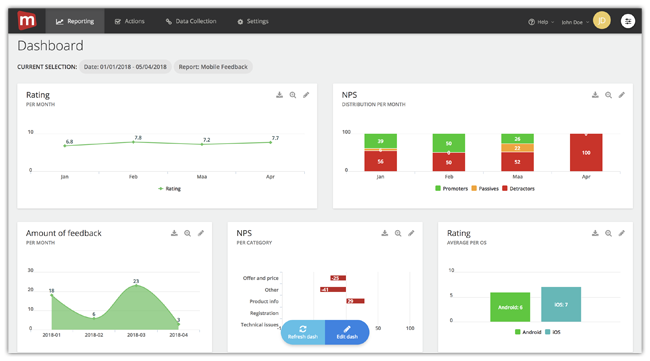 Mopinion’s SDK includes a wide range of features and capabilities that further enhance the feedback collection and analysis processes allowing marketers to achieve greater and more in-depth customer insights than most other feedback SDKs. Additionally, this SDK is part of a wider all-in-one solution for collecting and analysing feedback on all digital channels including websites, mobile web and email. This solution brings all data from these digital channels together giving our clients a better view and understanding of the digital customer. Marketers are provided with multiple options in terms of customisation and targeting. 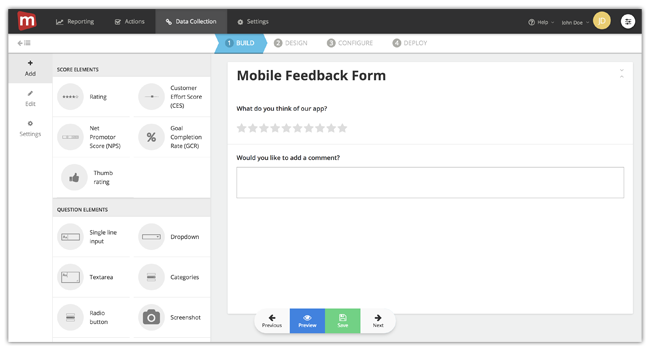 Unlike other providers, Mopinion’s clients are not limited to standard templates (that simply consist of a rating and open comments section), but rather they can customise feedback forms however they wish. This goes to say that marketers can add / change feedback questions, add their own design and logo and set up their own language. The software also includes several scoring options which are popular in the field of Customer Experience, such as Net Promoter Score (NPS), Customer Effort Score (CES), Goal Completion Rate (GCR), Customer Satisfaction (CSAT) and more. Not to mention, there are various research elements available to choose from such as multiple choice, selection lists (drop down lists), contact forms, and more. Clients can also set up notifications or messages with the new SDK. These customisable notifications help digital teams meet important marketing needs such as onboarding, influencing how visitors navigate within the app, informing customers of special offers or maintenance. Once changes have been made to a form, they are visible in real-time in the mobile app. This is possible without releasing or changing any code within the app itself. The interface of the feedback forms is rendered completely native. Since you cannot activate feedback forms via mouse movement and click behaviour in a mobile app, you have to adapt your approach. Using the Mopinion SDK, you can trigger feedback forms based on certain events. Examples of these events include performing a search, tapping on a button with your finger, or leaving an (ordering) process. What’s particularly unique about the new Mopinion SDK is that it now enables clients to combine these events. In other words, a feedback form can be deployed using a combination of multiple triggers. For example, you can customise trigger settings so that after a user navigates to a specific part of the app such as an in-app search function, 50% of users are shown a feedback form if they have are using iOS 11 or 12. The Mopinion SDK also allows Mopinion clients to collect visual feedback via their mobile app. This type of feedback gives mobile users the opportunity to add a screenshot from the app to their feedback. Once the screenshot option is selected in the feedback form by the user, the Mopinion SDK renders a screenshot and saves it in the Mopinion admin suite, which can then be analysed alongside other feedback items (e.g. scores, feedback categories or user agent). Our new mobile feedback solution also offers advanced analytics. 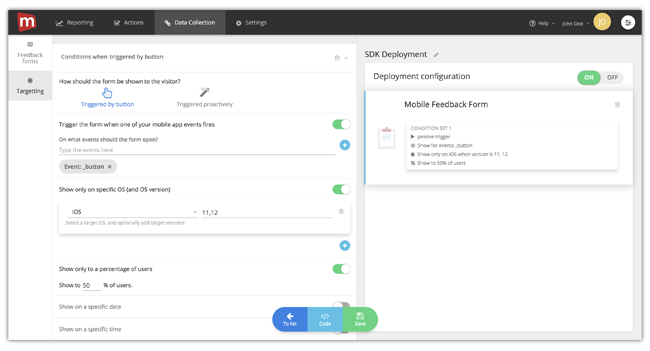 All feedback collected via the SDK trickles automatically into the customisable dashboard, where you can compare and zoom in on different feedback variables and trends. 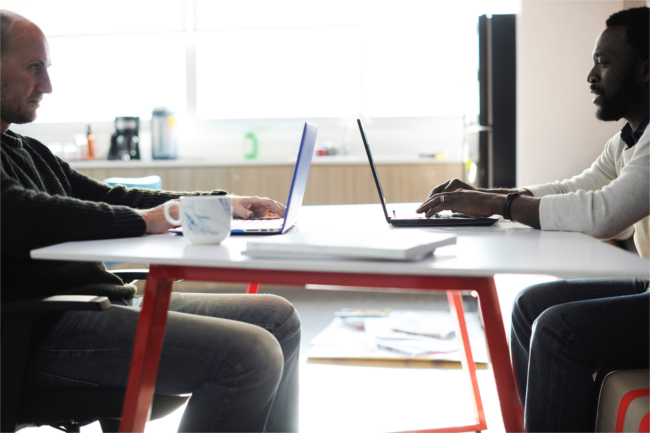 Mopinion clients can also analyse feedback items using text and sentiment analysis, categorise feedback automatically, set up email notifications, assign feedback tasks to team members, add notes and much more. With in-app feedback, in particular, there are several areas in which you can focus your analyses, including digital service & support, the overall user experience, technical issues (e.g. bugs), content performance and sales funnels & purchasing. Note: the areas you choose to analyse may depend on the type of app you offer. For example, an ecommerce app may focus more heavily on sales funnels and user experience, whereas a sports app will focus on the functionality of the tools within the app itself. This article shows you how to set up your dashboard. The Mopinion SDK is compatible with both iOS and Android operating systems. However, in addition to using programming languages Swift (for iOS) and Java (for Android), developers can also use React Native. 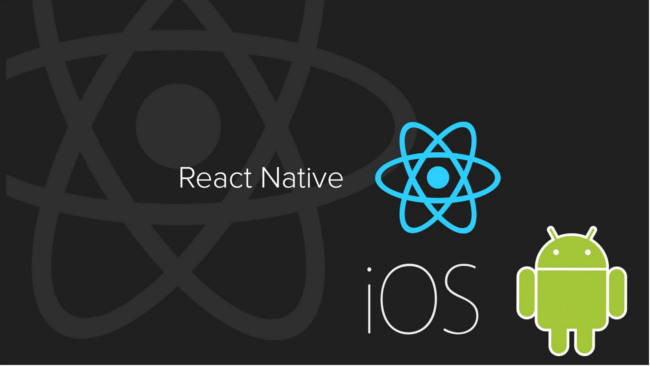 React Native is an increasingly popular framework used to build mobile apps. Want to learn more about the Mopinion SDK? We’d love nothing more than to help you get started collecting in-app feedback! Try out our demo app – available in the App Store for iOS and the Play Store for Android. Are you a developer? Please visit our GitHub repositories for more information. For Android, click here. For iOS, click here. For React Native, click here. Alternatively, we have lightweight SDK packages available for Android and iOS. Our latest lightweight mobile SKDs allow you to benefit from mobile in-app triggers without the usage of larger interface libraries. For Android, click here. For iOS, click here. Learn more about your mobile SDK download options here. Other SDK-related questions? Please send them to support@mopinion.com or see if they can be answered in our Support forum.